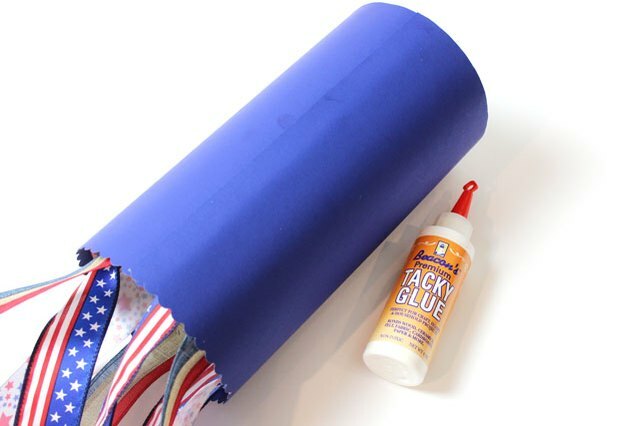 Show your pride with this patriotic wind sock, perfect for the 4th of July, Memorial Day, Veteran's Day or any time of year you want to display the red, white and blue. The stars and stripes wave in the breeze, thanks to the "tails" of the wind sock that catch gusts of air. They're so easy to make, you'll want to make several to display throughout your yard. Using a hobby knife, remove and discard the bottom of a cylindrical oatmeal canister. The top will already be open, as that is where the lid was located. The most popular sizes of oatmeal containers are the 42-ounce and 18-ounce packages. Both are ideal for wind socks. 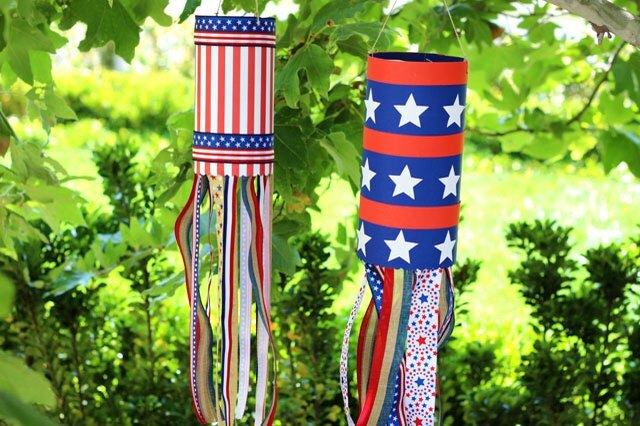 Cut pieces of ribbon to about 18 inches in length, selecting patriotic-colored ribbon in various styles and widths. 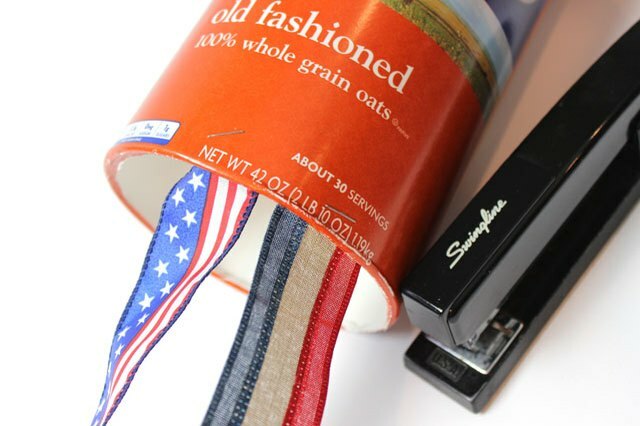 Staple the ribbon to the bottom of the oatmeal container, with the end of the ribbon on the inside. Continue stapling ribbons until the entire bottom rim is covered. 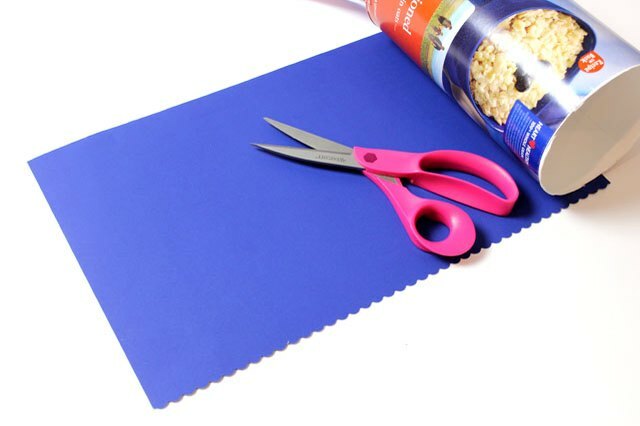 Cut a piece of construction paper with scissors to fit completely around the oatmeal container, and extending past the top and bottom by about ½ inch. As an optional decorative touch, cut scallops on the bottom edge of the paper. Wrap the paper around the container to hide the printing on the package, as well as the staples used to attach the ribbon. 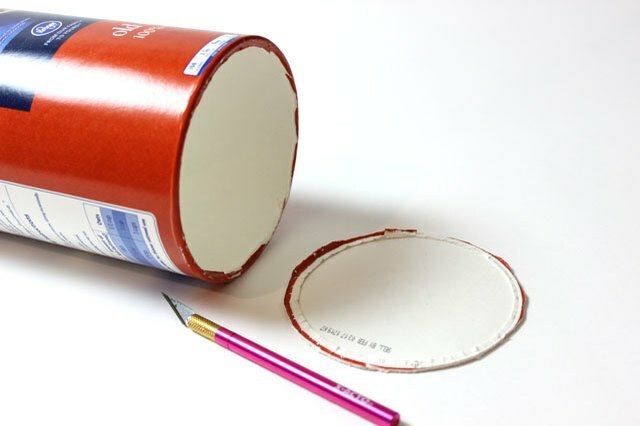 Use craft glue to attach the paper to the container. 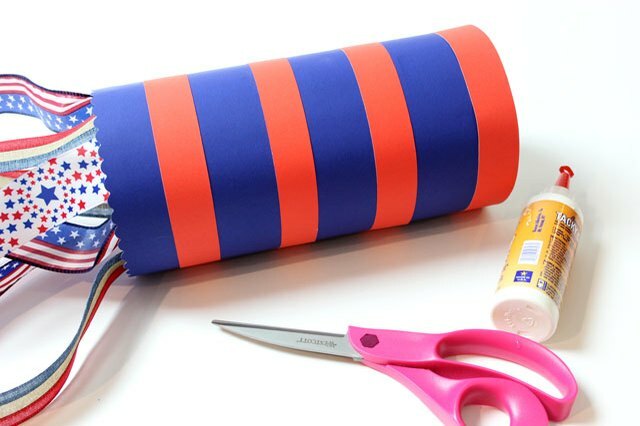 Cut out 1-inch to 2-inch stripes that are long enough wrap around the cylinder. Glue the stripes to the cylinder, leaving room between them to add stars. Draw stars freehand or trace them from a pre-printed sheet, and cut them out. Glue the stars to the wind sock between the stripes. 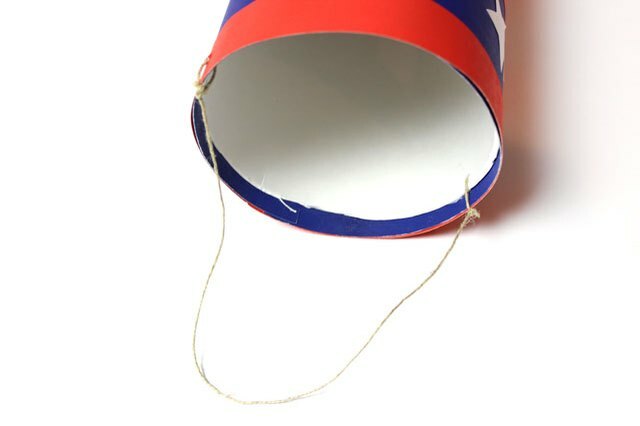 You can decorate the outside of the cylinder with more patriotic-themed ribbon. 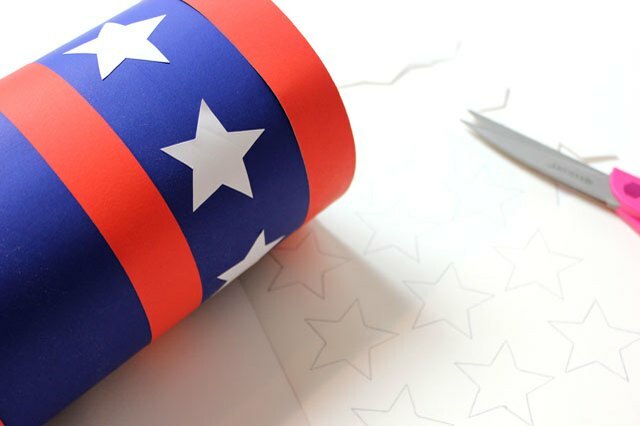 Also, look for scrapbook or wrapping paper with pre-designed red, white and blue elements. Using the hobby knife, punch two holes on opposite ends at the top of the wind sock. Thread string through the holes and secure with knots to create a hanging loop for the wind sock. Hang the wind sock outside on a tree branch or at the end of a flag pole. You may need another piece of string to tie the hanging loop to a branch. 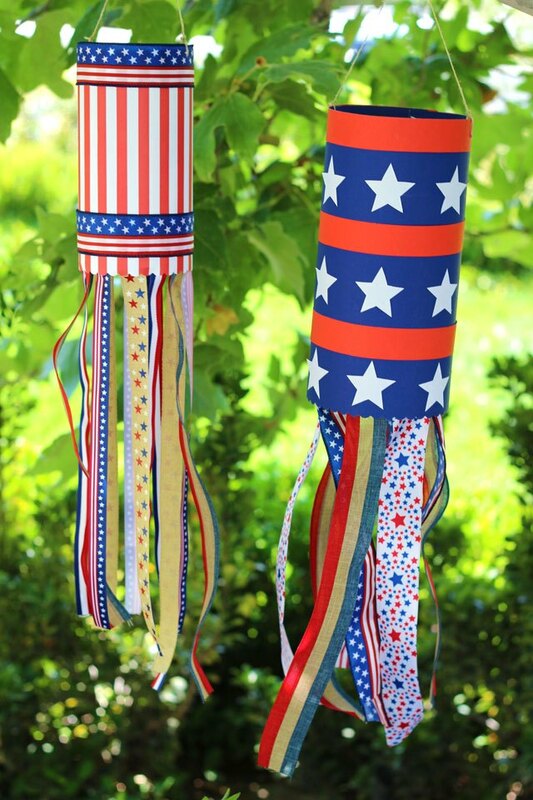 When hanging more than one wind sock, experiment with several patterns of stars and stripes for a patriotic array that will inspire the neighborhood.